Often used to describe the clock on the Houses of Parliament (or the tower in which it is located), the name Big Ben was actually first given to the bell that resides within. Officially known as the Great Bell, it is believed the popular nickname of Big Ben came from Sir Benjamin Hall, First Commissioner for Works (there is an alternative theory that it was named after Ben Caunt, a popular heavyweight boxer in the 1850s but the parliamentary website describes this as “unlikely”). The initial bell intended for the clocktower of the Houses of Parliament was cast by Warners of Norton, near Stockton-on-Tees, in August, 1856. Transported to London, it was tested in Palace Yard (where a clock tower had stood in medieval times) but a crack appeared during testing and so the bell had to be recast. With Warners apparently asking too much for the recasting, George Mears at the Whitechapel Bell Foundry was appointed instead. The new bell was cast on 10th April, 1858. With a diameter of 2.7 metres, the bell was too big to fit up the clocktower’s shaft vertically so it was turned on its side and the 13.7 tonne bell was winched up to the belfry in October that year. 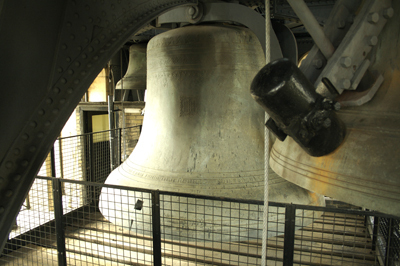 Four quarter bells, which chime on the quarter hour and varying in weight from 1.1 to 4 tonnes, were already in place (interestingly, all of the bells are fixed in position and struck on the outside rather than being allowed to swing and have a hammer strike the inside). Big Ben debuted on 11th July, 1859 (the clock had been started on 31st May), but in September that year the second bell also cracked. It took four years to find a solution (during that time, the bell was struck on the fourth quarter bell) and it was the Astronomer Royal, Sir George Airy, who found it. The solution involved turning the bell a quarter turn so the hammer didn’t restrike the crack site and replacing the hammer with a lighter one (the current hammer still weighs 200 kilograms!). A small square was also cut into the bell’s crack to prevent it spreading. Apart from occasional stoppages, the bell has struck ever since. For more on Big Ben, visit www.parliament.uk/bigben. Tours are only available to UK residents and can be arranged via local MPs (see here for more) or there are virtual tours for those who either don’t live in the UK or can’t get there (see here for more). IMAGE: Big Ben with a quarter bell in the fourground. PICTURE: Courtesy of UK Parliament.